If you are interested in becoming a Mason all you have to know is . . .
2020 marks the 200th anniversary of Masonry in Lancaster. In order to conduct the programs we have in store for the bicentennial celebration we are offering various products for sale through teespring.com. Please visit the store and enjoy! Grand Master Jess Raines and Grand Tyler Shaun Marolt installed Worshipful Master Dan Meenach and the officers of Lancaster #57 for the 2019 Masonic Year. 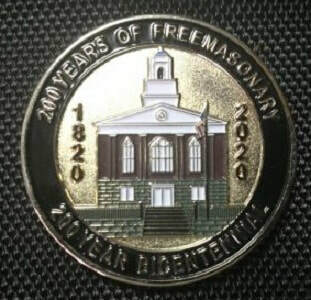 To commemorate our upcoming bicentennial in 2020, Lancaster Lodge #57 is offering these commemorative coins. The price is $20 each if picked up in person at a meeting or $25 shipped. Use the contact form on this website for more information. Here is a chance to leave your mark upon Masonry and Lancaster Lodge #57. Make a commitment to replace yourself by recruiting and signing a petition for a new petitioner. Visit replaceyourself.org to learn more.